The Marple Website donates £500 to Friends of the Park and sponsors Marple Athletic JFC! I was pleased that The Marple Website was able to donate another £500 to Friends of Marple Memorial Park from the banner advertising income on the main site, the forum and the Virtual Tour in 2015. I was also delighted that The Marple Website was able to become sponsor of Marple Athletic JFC Under 12s for the 2015/16 and 2016/17 Seasons. This sponsorship is possible due to the banner advertising income on The Marple Website, the Marple Community Forum and the Virtual History Tour of Marple for 2015 and is thanks to the excellent support from the local businesses who pay for low cost advertising on these sites. Follow this link to see who they are. The original purpose of the banner adverts on the sites was to generate income to cover running costs. This has been quite successful in recent years and has allowed some of the income to be donated to local causes. In 2011 £1,000 was donated to Friends of Marple Memorial Park for their Diamond Jubilee Project. In 2012 The Marple Website became the main sponsor of the Marple Christmas Cracker with a donation of £1,000 to Marple Business Forum. £500 was donated to the Skate Park Project in 2013 - this was matched by Forever Manchester, effectively doubling our our money - and in 2014 a further £1,000 was donated to the Skatepark Community Match Funding. This year's donation of £500 to Friends of Marple Memorial Park and the £350 cost of sponsoring Marple Athletic U12s takes the banner advert contributions over the last 5 years to £4,350 and the overall total donated to local causes by The Marple Website since 2006 to an amazing £9,050! A banner advert is a great way to promote your business and support your local community web site at the same time. There's also a sponsors' area of the forum that advertisers can use if they wish. The banners are only available to local Stockport based organisations and businesses and there are discounts for MBF members too. So if you're interested in promoting your business on the site have a look here, and get in touch. Over 2.8 Million image views on the Marple Website Virtual History Tour! As I write, the counter on the Virtual History Tour has reached 2,821,482 image views and we are now working towards the amazing target of 3.0M sometime in 2016. Due to the demands of the skatepark project and building a new extension at home the Virtual Tour has taken a bit of a back seat this year, but we've still managed to add nearly 800 photos over the last 12 months. The total number of images on the Virtual Tour has now reached 10,513 and they've been viewed an amazing 348,944 times since Christmas 2014. Despite scanning the last folder from Marple Local History Society's photo archives in 2014 I still have a significant backlog of new random folders of images from the society plus a large number of postcard images provided by collector Janet Holmes and I'm looking forward to sharing them during 2016. Without wishing to steal their thunder, The Marple Website has also been working on a further collaboration with Marple Local History Society this year, so look out for an announcement early in the New Year that will have local history buffs salivating! Once again, local photographer Arthur Procter has done some sterling work recording just about everything that happens in Marple over the last year and his excellent contributions have included Marple Carnival 2015, Marple 150 and the last ever Marple Locks Festival, Hawk Green Festival, Mellor Country Fete, Mellor Mill Fact and Fun Day, Marple Food and Drink Festival, the Remembrance Service in Memorial Park and Marple 2015 Christmas events. We've also had contributions from other photographers too, notably from a young Jake Taylor who I hope we'll see more of in 2016. Helping to keep Marple Memorial Park at its best! The Marple Website is strongly linked with Friends of Marple Memorial Park and, as I said last year, it's particularly important that the history and heritage of the park and the reason it came into being are understood by the local community 100 years on from the devastating events of the so called "Great War". The WWI Timeline Display Project has been running since the 100th anniversary of the war's start in August 2014. There are now cards on the railings commemorating the 100th anniversaries of 21 Marple men who lost their lives between the start of the war and Christmas 1915. Try to imagine the impact this must have had on Marple people and local communities across the country experiencing the same thing. It's hard to do but hopefully our display is giving at least a small insight into what it must have been like and encouraging people to learn more about the men who fell. Our WWI Silhouette Project conceived in 2014 and installed in February and March this year has been a fabulous success. The objective was to remind people of the park's origins as a War Memorial Park and based on positive comments received this has been one of our most successful projects ever. Even we didn't realise just how striking the signs would be from a distance. It was particularly special that local man Alan Burton was so inspired by our idea and in-turn inspired David Birch, MD of Advanced Engineering Techniques in Sheffield, to provide the materials, laser-cutting and manufacturing free of charge. They didn't even hesitate when we cheekily said "at that price we could afford two" and we owe these two gentlemen a very big thank you! Another success in the park this year has been the culmination of a long campaign to install CCTV to combat antisocial behaviour around the bowling green and buildings. We've had excellent support from Marple's local councillors with this and also from the Community Safety Unit and Greater Manchester Police. We've been meeting with them regularly and as a result there has also been consultation with young people in the park through the summer and there will be some youth work done in 2016 too. We've always had great support from Marple's councillors, past and present, since forming the Friends group in 2003. We've also had brilliant support from the local community too. This year once again, as with the proposed toilet closures several years ago, we've been able to rally support from the local community via The Marple Website and social media to help us get things done for the good of the park. This year the community helped us lobby for a new roundabout in the Infants Play Area and we've just learned that following analysis of consultation results the council has decided not to remove the permanent assistant from the park too. So thank you to everyone who has taken the time to respond to our calls for help. Friends of the Park have been focused on fundraising for Marple Skatepark Development Project for the last few years. There's more about that below but before moving on it's worthy of mention that the group's fundraising total since they began in 2003 has now surpassed £74,000! 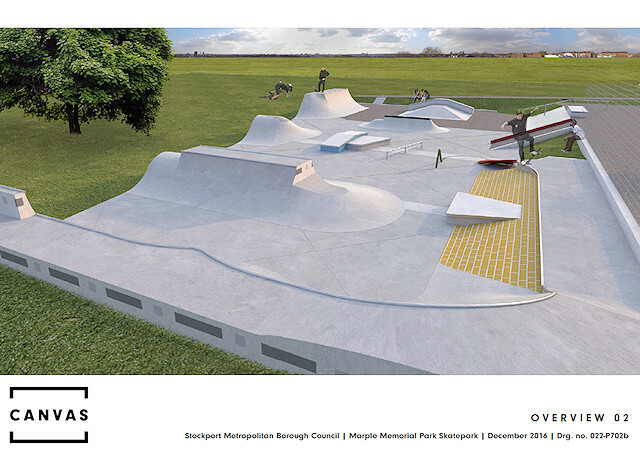 Friends of the Park's most ambitious project yet is to upgrade and extend the Skatepark in Marple Memorial Park. We've been working on this since 2011 with Lewis Abbott, one of the skaters who campaigned for the original facility, several other older users of the skatepark, Marple Hall School, Marple Library, SMBC, Marple Civic Society and Marple Vision Partnership. This time last year we were just getting over the first major setback to our funding strategy and looking forward positively to the new opportunity that we hoped would help bring the project to fruition. Sadly this was not to be either and we had our second major setback in May 2015 when our £62,000 grant application to the Lafarge Tarmac Community Fund was rejected. We managed to pick ourselves up again after this and have continued to raise money locally by whatever means we can while we seek alternative grant funding opportunities. These are thin on the ground and oversubscribed so it looks very much like Marple is mostly going to have to do it for themselves! We have had a major boost from Stockport Council, who had previously pledged £22,000 of match funding. In August 2015 the council agreed to match the money that Friends of the Park raise £1 for £1 up to £50,000 from Formal Sports Commuted Sums. This agreement has a deadline of April 2018, which is the same time that the current planning permission expires. So we have a design that's been developed with users, we gained planning permission in April this year and we have a contractor to build the skatepark everyone wants. All we need now is £100,000! Thanks to the new agreement with the council every £1 we can raise is worth double, so we are much closer than we were, but it is still a big challenge. We hope that the local community will continue to support us as we battle on! £50 donation from High Lane Garage. £223 raised by Diane Jackson family and friends. £793 collected with Marple and Goyt Valley Rotary (December 2014). £600 raised by Marple and District WI (Christmas Cracker 2014). £53 raised by pupils Taz and Brendan in a sponsored silence at Marple Hall School. £240 donated by local author K.C. Dowling from the proceeds of "A Man of Insignificance". £402 from Family Treasure Hunt in the park organised by Julian Wadden Estate Agents. £327 raised at Marple Carnival and Marple Locks Festival. £383 from Ring o' Bells Quiz Nights in 2015. £1,000 grant award from Stockport Homes. £150 from Marple Carnival Committee. £400 from Lewis Abbott's sponsored Beard-Off. £660 raised at Marple Food and Drink Day. £20 donation from Friends of Cromwell Avenue Park. £250 from Marple Locks Heritage Society. £42.50 from St Mary's RC Primary School in Marple Bridge. £30 from The Marple Website. Approximately £1,470 from local people via Local Giving "Grow Your Tenner" Scheme. £983 from Marple Skatepark Fest Music Night at Hawk Green Cricket Club, supported by local bands and All Things Nice. £458 Hamper Raffle, competition and donations in Marple Asda. £363 small donations via Local Giving. £155 Hatters Pub Halloween Night. Thanks are due to everyone who contributed to the above of course and it's particularly good to see local businesses like Julian Wadden, All Things Nice and the Hatters Pub getting involved this year and adding to the growing list of businesses that have helped us so far. I hope we can encourage more to help in 2016 as we battle to get closer to that £100,000 total. Special mention is also due to the new Marple Adsa, whose Community Life Champion has really got behind us in recent months with donation of a hamper to raffle at our Skatepark Fest music night and arranged for us to use the store for our own hamper raffle and competition after the cancellation of the Christmas Cracker. We are also currently in the Asda store's "Chosen By You... Given By Us" scheme at present, so you can vote for us with your green tokens when you shop, and we hope to be bag packing there in the New Year. At the moment you can also support the project with blue tokens in the local Nationwide branch if you are one if their customers! So it's hopefully onwards and upwards for Marple Skatepark Development Project, please get in touch if you think you can help us! As I say every year, The Marple Website thrives on its visitors coming back again and again and it's all about the local community making contributions and keeping the site fresh, active and alive. There are many ways that people can do this, including registering in the forum and posting your two-penneth in the variety of topics discussed there, or publicising your organisation's activities in the Events Calendar. Independent contributions and articles on local history, attractions or other matters of interest to the local community are particularly welcome too. It was good that all our main candidates for Hazel Grove MP in the May elections made the effort to join or contribute to the forum this year. Congratulations to new MP William Wragg, who was one of these. Recently we've had our first local councillors register and start contributing to discussions, as have some of the candidates in the local elections due in May 2016. This is a great step forward in a time when there are so many distractions from national and global social media. I hope we'll be able to keep our head above the water with contributions to our very local community forum in 2016. 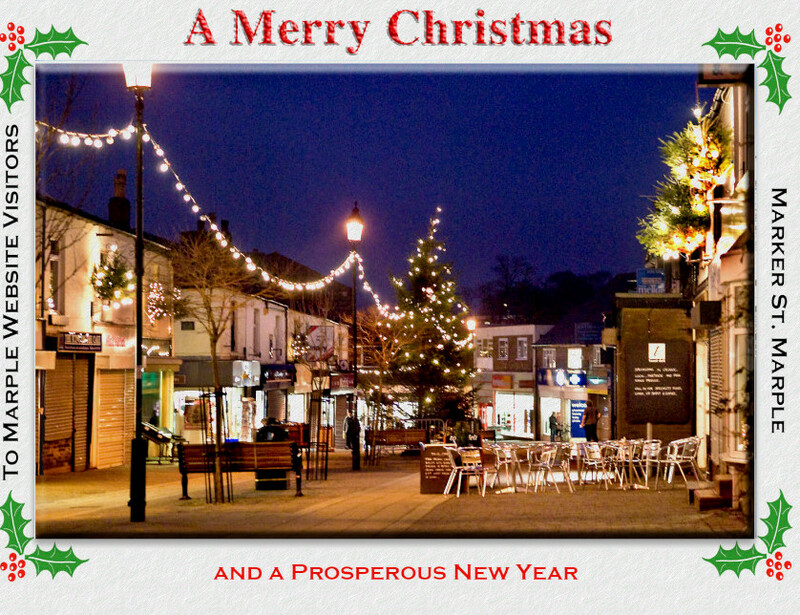 At Christmas 2014 I hoped that 2015 would be the year I could launch a major upgrade of The Marple Website - a daunting task due to the sheer size and number of pages that have been building since 1998. The work is underway but unfortunately due to other demands I've not made as much progress as I'd hoped. Maybe 2016 will be the year I overcome that huge hurdle! As usual I'm very grateful to Howard for help moderating the Forum and to Arthur Procter for his fantastic photographs that help to keep us in touch with everything happening in Marple throughout the year on The Marple Website. Thanks to everyone else who supports the site by keeping on coming back to see what's new - that's the most important thing of all!